Yeah Yeah Yeahs played their first hometown show in four years at Kings Theatre last fall, and they just played their second one at Governors Ball yesterday (6/1), under the hot evening sun. At Kings Theatre and their other post-hiatus headlining shows, they’ve been screening their new documentary before playing, and doing a set that’s heavy on their classic debut Fever To Tell, but they mixed it up more for this festival set, playing a few more It’s Blitz! songs that they didn’t play last fall, and breaking out “Down Boy” from the Is Is EP, which they slowly started re-introducing into their setlists last month. We still got five of the best Fever To Tell songs (“Y Control,” “Black Tongue,” “Pin,” “Maps,” and the encore of “Date with the Night”), and like they did at Kings last fall, the Yeah Yeah Yeahs proved that they still totally rip just like the old days. Yeah Yeah Yeahs are one of those bands where every member brings something truly distinct and truly necessary to the table. The obvious star is of course Karen O, who’s still a wild performer, running and jumping around and making use of the entire stage (and jumping off the stage and going up to fans at the barrier), going through multiple spectacular outfit changes, swinging her mic, smashing her mic into the stage, and doing all of this while delivering a powerful vocal performance that soared across the massive festival grounds. She still does all the unhinged vocal spurts like the “uh huh”s of “Black Tongue” and the “bah bah bah bah bah bah bah bah donom donom donom donom”s of “Pin” with as much ferocity as she did 15 years ago, and she still does the tender stuff like “Maps” as well as ever too. Nick Zinner is not only still dripping with effortless New York art-punk cool, he also reminds you that he has always been an indie rock guitar player like few others. These days, Yeah Yeah Yeahs have a fourth live member to add bass, acoustic guitar, and keyboards to some songs, but they still do a lot of the Fever To Tell songs as a trio, and Nick Zinner’s unique style still has the YYYs blaring as if they were a much fuller band. And holding it all down is Brian Chase, whose style is more like a jazz drummer (and he actually has a jazz album on the way), but who is still as powerful as you need to be for a hard-hitting song like “Date with the Night.” He also spends the whole show looking absolutely thrilled to be there, and while most of the crowd interaction was handled by Karen, Brian frequently stood up from behind his kit to lead the GovBall crowd in handclaps. The three of them also just still look so natural playing with each other, and when you see them live today, it feels like they never left. Hopefully with all the rekindled flames, they’re back in it for the long haul. Speaking of bands who get a very full, very loud sound with just one guitar, Yeah Yeah Yeahs played back to back with fellow early ’00s rock revivalist Jack White (YYYs actually played their first show ever opening for Jack’s bass-less White Stripes at NYC’s Mercury Lounge in 2000). Jack has a much fuller band these days than when he was doing the White Stripes, including a bassist, two keyboard players, and a complex drummer (aka Carla Azar of Autolux) — though it’s actually a slightly more stripped-down rock setup than he had when he was touring his first two solo albums (which had people playing fiddle, pedal steel, mandolin and stuff) — but one of the most noticeable things about this lineup is that Jack is still the only guitarist. 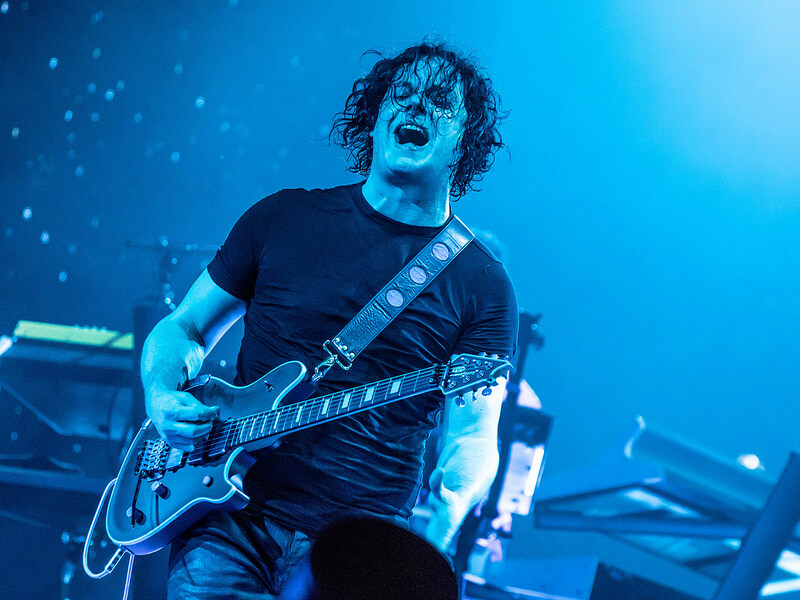 Jack White gets called a modern-day guitar god pretty often, and it’s not impossible to see why from listening to his albums, but it becomes really clear when you see him play. His live show’s got a much looser, freer feel than his solo albums — he busts out off-the-cuff licks before and after songs, and he really lets that thing scream during his songs. I had to double check a few times to make sure there wasn’t a second guitarist standing off to the side; it really is so impressive how huge he can make just one guitar sound. His songs also sound even better live than recorded. Jack has yet to make a solo album as gripping as White Blood Cells or Elephant, but his solo songs really deliver in a live environment. Even this year’s Boarding House Reach, which is probably his weakest solo album, is home to some of the best songs in his live set. He’s been kicking his shows off with “Over and Over and Over,” which brings things from 0 to 100 real quick, and Boarding House Reach opener “Connected By Love” is as much a highlight of his live show as some of the White Stripes songs. He also keeps his live shows fairly varied for a (non-jam-band) artist of his fame level. I just saw him last week at Boston Calling, and though certain parts of the set were identical, he did do a nice amount of songs at GovBall that he didn’t do at BC, including White Stripes classics “Dead Leaves and the Dirty Ground” and “We’re Going to Be Friends,” both of which sounded as great today as they do on the old White Stripes records. My biggest takeaway from this show: Jack White needs to do a proper (not limited edition Vault exclusive) live album. Pictures of Jack White and the Yeah Yeah Yeahs are in the gallery above. Videos and setlists below. Check out more pictures from Friday at Governors Ball HERE. If you’re not at the fest, you can stream it live. Whether you’re going or streaming, check out our list of artists we’re excited to see.